DIE Veneris, videlicet, 10 die Junii. Sir Philip Manwaring and Lord Loftus. Lord Lieutenant desires he may be dispatched to Ireland. Heads to be prepared for a Conference about it. Message from the H. C. with the Propositions for raising Money and Horse. That they may be printed. Lords that will bring in Money and Horses. The Horse to be mustered. Propositions to be printed, and sent to the City. Message to the H. C. for Committees to go with the Propositions into the City. Committee to consult absent Lords about the Propositions. Assistants of the House about the Propositions. Finch and Halsall examined about the Proclamation concerning the Militia. Mr. Wiseman and the Lord Mayor to attend. 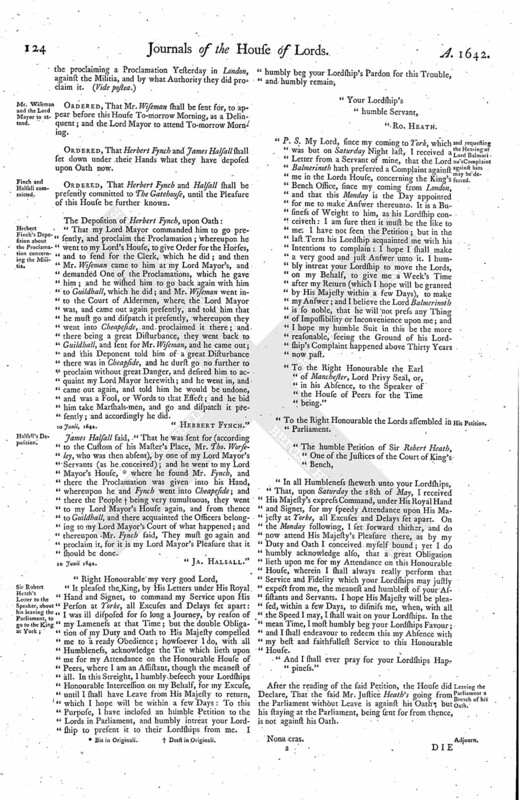 Herbert Finch's Deposition about the Proclamation concerning the Militia. and requesting the Hearing of Lord Balmari no's Complaint against him may be deferred. Leaving the Parliament a Breach of his Oath. The Petition of Sir Phillip Manwaringe was read, concerning the sealing of Deeds to the Lord Loftus. Ordered, That both Sides shall attend Mr. Justice Foster, to settle the Deeds and Assurances between them, according to the Order of this House; or else to report the same to this House. This House was of Opinion, That the Judges are not tied by their Oaths. The Lord Lieutenant of Ireland expressed his Desires to this House, "That divers Censures and hard Opinions are of him abroad, because he is not gone into Ireland, to look to the Affairs and Safety of that Kingdom; and because the King hath written divers Times to the Parliament to hasten his Lordship: His Lordship humbly desired their Lordships to acquaint the House of Commons, that it is his Lordship's Desire that he may be dispatched into Ireland, for the Safety of that Kingdom." The House Resolved, to have a Conference with the House of Commons concerning this Business; and the Lord Admiral, Earl Essex, Earl Holland, and the Earl of Bristoll, were appointed to draw up what is fit to be offered to the House of Commons at this Conference, concerning this Business. To meet To-morrow, at Eight a Clock. "1. 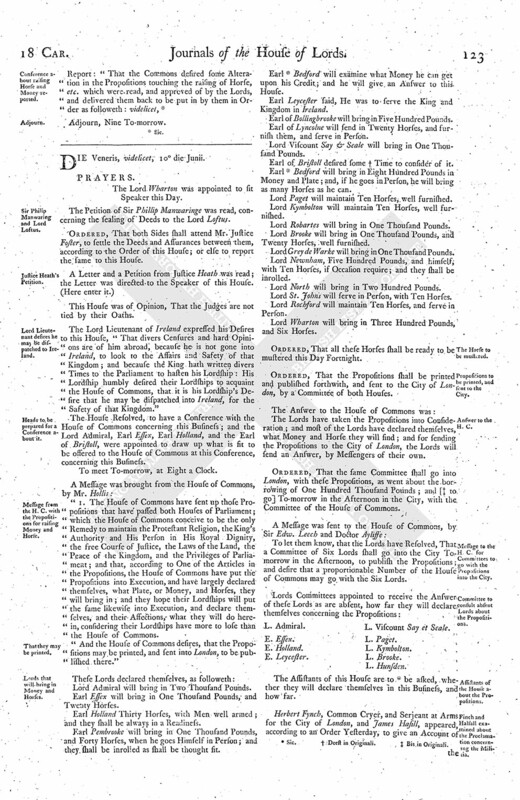 The House of Commons have sent up those Propositions that have passed both Houses of Parliament; which the House of Commons conceive to be the only Remedy to maintain the Protestant Religion, the King's Authority and His Person in His Royal Dignity, the free Course of Justice, the Laws of the Land, the Peace of the Kingdom, and the Privileges of Parliament; and that, according to One of the Articles in the Propositions, the House of Commons have put the Propositions into Execution, and have largely declared themselves, what Plate, or Money, and Horses, they will bring in; and they hope their Lordships will put the same likewise into Execution, and declare themselves, and their Affections, what they will do herein, considering their Lordships have more to lose than the House of Commons. "And the House of Commons desires, that the Propositions may be printed, and sent into London, to be published there." Lord Admiral will bring in Two Thousand Pounds. Earl Essex will bring in One Thousand Pounds, and Twenty Horses. Earl Holland Thirty Horses, with Men well armed; and they shall be always in a Readiness. Earl Pembrooke will bring in One Thousand Pounds, and Forty Horses, when he goes Himself in Person; and they shall be inrolled as shall be thought fit. Earl (fn. 1) Bedford will examine what Money he can get upon his Credit; and he will give an Answer to this House. Earl Leycester said, He was to serve the King and Kingdom in Ireland. Earl of Bollingbrooke will bring in Five Hundred Pounds. Earl of Lyncolne will send in Twenty Horses, and furnish them, and serve in Person. Lord Viscount Say & Seale will bring in One Thousand Pounds. Earl of Bristoll desired some (fn. 2) Time to consider of it. Earl (fn. 1) Bedford will bring in Eight Hundred Pounds in Money and Plate; and, if he goes in Person, he will bring as many Horses as he can. Lord Paget will maintain Ten Horses, well furnished. Lord Kymbolton will maintain Ten Horses, well furnished. Lord Robartes will bring in One Thousand Pounds. Lord Brooke will bring in One Thousand Pounds, and Twenty Horses, well furnished. Lord Grey de Warke will bring in One Thousand Pounds. Lord Newnham, Five Hundred Pounds, and himself; with Ten Horses, if Occasion require; and they shall be inrolled. Lord North will bring in Two Hundred Pounds. Lord St. Johns will serve in Person, with Ten Horses. Lord Rochford will maintain Ten Horses, and serve in Person. Lord Wharton will bring in Three Hundred Pounds, and Six Horses. Ordered, That all these Horses shall be ready to be mustered this Day Fortnight. Ordered, That the Propositions shall be printed and published forthwith, and sent to the City of London, by a Committee of both Houses. The Lords have taken the Propositions into Consideration; and most of the Lords have declared themselves, what Money and Horse they will find; and for sending the Propositions to the City of London, the Lords will send an Answer, by Messengers of their own. Ordered, That the same Committee shall go into London, with these Propositions, as went about the borrowing of One Hundred Thousand Pounds; and [ (fn. 3) to go] To-morrow in the Afternoon in the City, with the Committee of the House of Commons. To let them know, that the Lords have Resolved, That a Committee of Six Lords shall go into the City Tomorrow in the Afternoon, to publish the Propositions; and desire that a proportionable Number of the House of Commons may go with the Six Lords. E. Leycester. L. Viscount Say et Seale. The Assistants of this House are to (fn. 1) be asked, whether they will declare themselves in this Business, and how far. Ordered, That Mr. Wiseman shall be sent for, to appear before this House To-morrow Morning, as a Delinquent; and the Lord Mayor to attend To-morrow Morning. Ordered, That Herbert Fynch and James Halsall shall set down under their Hands what they have deposed upon Oath now. Ordered, That Herbert Fynch and Halsall shall be presently committed to The Gatehouse, until the Pleasure of this House be further known. "That my Lord Mayor commanded him to go presently, and proclaim the Proclamation; whereupon he went to my Lord's House, to give Order for the Horses, and to send for the Clerk, which he did; and then Mr. Wiseman came to him at my Lord Mayor's, and demanded One of the Proclamations, which he gave him; and he wished him to go back again with him to Guildhall, which he did; and Mr. Wiseman went into the Court of Aldermen, where the Lord Mayor was, and came out again presently, and told him that he must go and dispatch it presently, whereupon they went into Cheapeside, and proclaimed it there; and there being a great Disturbance, they went back to Guildhall, and sent for Mr. Wiseman, and he came out; and this Deponent told him of a great Disturbance there was in Cheapside, and he durst go no further to proclaim without great Danger, and desired him to acquaint my Lord Mayor herewith; and he went in, and came out again, and told him he would be undone, and was a Fool, or Words to that Effect; and he bid him take Marshals-men, and go and dispatch it presently; and accordingly he did. James Halsall said, "That he was sent for (according to the Custom of his Master's Place, Mr. Tho. Worseley, who was then absent), by one of my Lord Mayor's Servants (as he conceived); and he went to my Lord Mayor's House, (fn. 4) where he found Mr. Fynch, and there the Proclamation was given into his Hand, whereupon he and Fynch went into Cheapeside; and there the People (fn. 5) being very tumultuous, they went to my Lord Mayor's House again, and from thence to Guildhall, and there acquainted the Officers belonging to my Lord Mayor's Court of what happened; and thereupon Mr. Fynch said, They must go again and proclaim it, for it is my Lord Mayor's Pleasure that it should be done. "P. S. My Lord, since my coming to York, which was but on Saturday Night last, I received a Letter from a Servant of mine, that the Lord Balmerinoth hath preferred a Complaint against me in the Lords House, concerning the King's Bench Office, since my coming from London, and that this Monday is the Day appointed for me to make Answer thereunto. It is a Business of Weight to him, as his Lordship conceiveth: I am sure then it must be the like to me. I have not seen the Petition; but in the last Term his Lordship acquainted me with his Intentions to complain: I hope I shall make a very good and just Answer unto it. I humbly intreat your Lordship to move the Lords, on my Behalf, to give me a Week's Time after my Return (which I hope will be granted by His Majesty within a few Days), to make my Answer; and I believe the Lord Balmerinoth is so noble, that he will not press any Thing of Impossibility or Inconvenience upon me; and I hope my humble Suit in this be the more reasonable, seeing the Ground of his Lordship's Complaint happened above Thirty Years now past. "To the Right Honourable the Earl of Manchester, Lord Privy Seal, or, in his Absence, to the Speaker of the House of Peers for the Time being." "In all Humbleness sheweth unto your Lordships, That, upon Saturday the 28th of May, I received His Majesty's express Command, under His Royal Hand and Signet, for my speedy Attendance upon His Majesty at Yorke, all Excuses and Delays set apart. On the Monday following, I set forward thither, and do now attend His Majesty's Pleasure there, as by my Duty and Oath I conceived myself bound; yet I do humbly acknowledge also, that a great Obligation lieth upon me for my Attendance on this Honourable House, wherein I shall always really perform that Service and Fidelity which your Lordships may justly expect from me, the meanest and humblest of your Assistants and Servants. I hope His Majesty will be pleased, within a few Days, to dismiss me, when, with all the Speed I may, I shall wait on your Lordships. In the mean Time, I most humbly beg your Lordships Favour; and I shall endeavour to redeem this my Absence with my best and faithfullest Service to this Honourable House. "And I shall ever pray for your Lordships Happiness." After the reading of the said Petition, the House did Declare, That the said Mr. Justice Heath's going from the Parliament without Leave is against his Oath; but his staying at the Parliament, being sent for from thence, is not against his Oath.